Ride Receipts - Uber and Lyft receipts on demand. Got a ton of Uber and Lyft receipts? 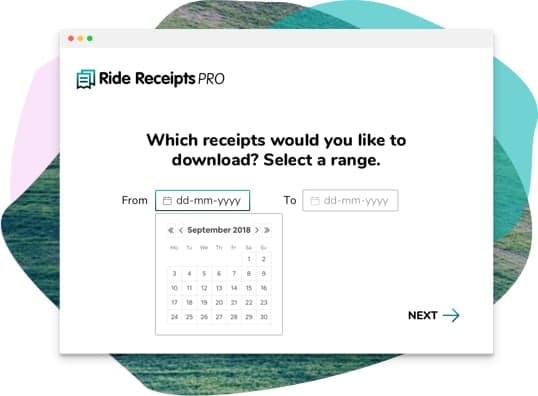 Ride Receipts is a desktop app that helps rideshare users get their receipts in order for their taxes. It’s ideal for business owners on the go, self-employed professionals, and anyone who gets reimbursed for travel. Ride Receipts makes bookkeeping, taxes and audits a breeze. Download your Uber and Lyft receipts from as far back as you need with our new PRO version. Save even more time with itemized Uber and Lyft expense reports in Excel. Use it to keep track of your expenses, or send it off to your accountant for filing. See an exampleSee an example. Filtering is limited to current year and last year’s trips. Expense report is not included. Your receipts are automatically downloaded, renamed and organized by date. Includes basic stats on how many trips you took and your total spend. Download Uber and Lyft receipts from your Gmail (or Google business email) account. Full control over filters. Download trips from as far back as you need and set up a custom date range. You get a personalized expense report autogenerated in Excel, plus everything in the free version. Ready for your accountant or bookkeeper. Your itemized expense report includes each trip date, total, tax amount, and fees. Additionally, if you're using Uber, your receipts will be organized by business or personal profile. Download Uber and Lyft receipts from your Gmail (or Google business email) account or Microsoft email account (i.e Outlook, Live, Hotmail). 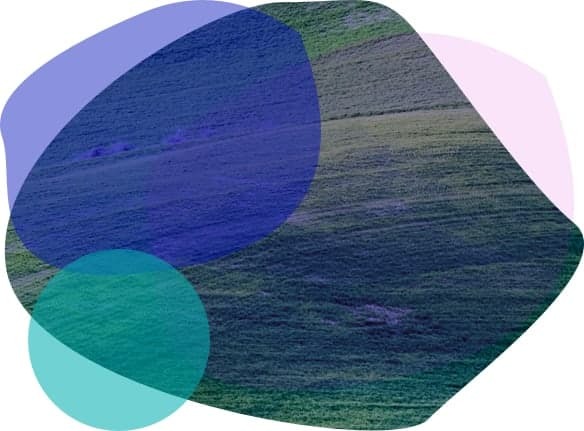 Trip filters Filtering is limited to current year and last year’s trips. Full control over filters. Download trips from as far back as you need and set up a custom date range. Expense report Expense report is not included. Your receipts are automatically downloaded, renamed and organized by date. You get a personalized expense report autogenerated in Excel, plus everything in the free version. Ready for your accountant or bookkeeper. Trip stats Includes basic stats on how many trips you took and your total spend. Your itemized expense report includes each trip date, total, tax amount, and fees. Additionally, if you're using Uber, your receipts will be organized by business or personal profile. Compatibility Download Uber and Lyft receipts from your Gmail (or Google business email) account. Download Uber and Lyft receipts from your Gmail (or Google business email) account or Microsoft email account (i.e Outlook, Live, Hotmail). The app will download the Uber or Lyft receipts from your Gmail/Google Mail account or Outlook/Microsoft email account.The files will automatically organize themselves in your Documents folder. The app will download your Uber or Lyft receipts from your Gmail/Google Mail account or Outlook/Microsoft email account to your Documents folder. Your receipts are organized in folders by month and year with custom file naming. Don’t waste time downloading everything one by one. We know you have better things to do. Like, literally anything. 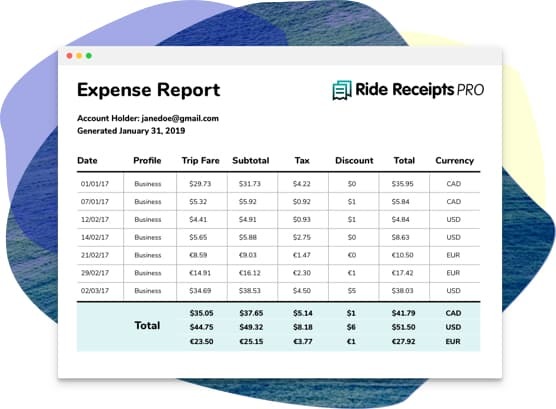 Ride Receipts simplifies your Uber and Lyft expenses.